Living on the “Costa del Sol” clearly implies perceiving daily life differently. Established as an architectural studio for more than 40 years, our goal is to give architectural form to the high quality of life that sets us apart from other destinations. Our professional dedication is rooted in diversity. We specialize in individual projects, ranging from hotels to exclusive villas, apartment complexes, shopping centers and golf clubs; all this within the framework of urban design and development, in which our main concern is attention to detail. Among our achievements are: Hotels Las Dunas, Kempinsky, Istan Valley, Marriott, Marbella del Este. Apartment complexes: Aloha Park, Los Arqueros, Club Sierra, La Villa and Altavista de Alcaidesa. Villas: more than 200 exclusives homes in La Zagaleta, Sierra Blanca y Marbella Club Golf. Golf clubs in Riviera del Sol and La Zagaleta. The long working experience of the office, makes possible high levels of excellence on finishing and detailing, creating personalized ambient adapted to each client and place. We provide consultation and advice according to the needs and budgets of each project, establishing a dialogue with each client to define details, textures and colours. The team formed over the years comprises of: coordination, project and technical architects, draughtsmen and administrative staff. We develop our projects in conjunction with teams of engineers specialised in structures, installations, infrastructures, landscapers, each contributing to a wealth of human expertise capable of taking on any size of project. Born in Buenos Aires, Argentina, he studied at the National University of Buenos Aires, title validated by the Polytechnic University of Madrid. In 1973 he began his professional work in Seville and in 1976, professionally independent, he developed projects of different kinds in Madrid, Cadiz, Seville and Marbella among others. 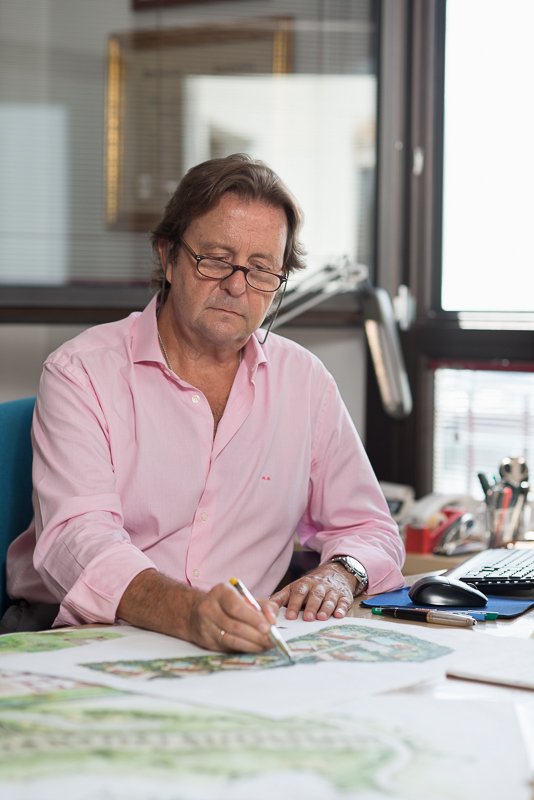 Established in Marbella since 1982 with his firm Baldrich Architects, achieves through his long experience maximum levels of quality and exclusivity in his works.